Apologies for the long absence, I was living in the woods for the summer. I have a few patterns to share. Anteaterina was made to serve as a reminder to never watch Princess Tutu again. Her arms are wired so she’s a bit poseable, and poly pellets give her legs and tail weight so she can stand. 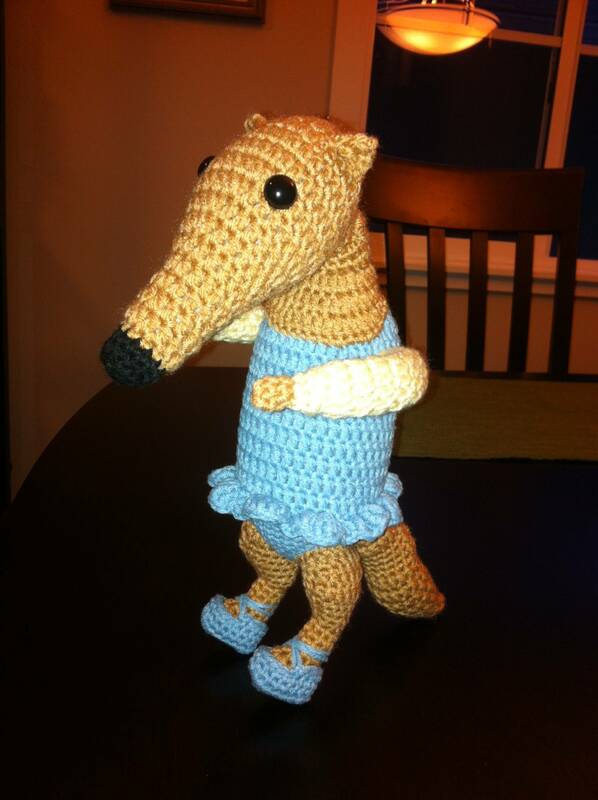 Because sometimes an anteater just wants to be the best ballerina she can be. Round 1: With black and 4.0 mm hook, sc 6 in a magic circle. Cont. in a spiral. In approximately the 14th round, insert a set of 10 mm black safety eyes about six stitches apart. Round 1: with lake and 3.5 mm hook, sc 6 in a magic circle. Cont. in a spiral. I didn’t want to fiddle with colour changes for the body, so I shaped the neck to also cover the area of the body that wouldn’t be covered by the bodysuit. It’s a bit fiddly, but if you sew it down smoothly, it looks quite good. With topaz and 4.0 mm hook, ch 16, sl st to join. Continue in a spiral. Sew the neck to the body as in the picture. Stuff it before sewing to the head. Don’t stuff the chest area, but lightly stuff the back. Sew in place on the head. The feet are made by beginning with a chain, but working both sides of it to continue in a spiral. Put poly pellets in the bottom half or so of each leg then stuff the rest normally. Sew the legs to the body so she’s in a standing position. Use the shaping on the legs and fold the fabric under if necessary to get them to lie nicely. Sc 4, sl st 1. Cut yarn and pull through. Put the shoe on her foot and wrap the yarn tail around her leg like a ballet slipper. Tie off on the other side. Put poly pellets in the bottom half of her tail then stuff the rest normally. She needs to use her tail to balance, so make sure you place it so it can touch whatever she’s standing on. Finish, but don’t close off the sts. Leave it open and finish stuffing, then stitch to the body. The tutu is made by crocheting into the fabric of the body. Pick the height that you would like the tutu at and work around in a circle. It’s a good idea to start at the back; since the fabric is spiralled, you will need to adjust your stitch placement in a few spots to make it join together. With lake and 3.5 mm hook, insert your hook in your chosen spot near the back of the body. Ch 1. *tc 5 in 1, skip next st, hdc 5 in 1, skip next st, repeat from * around. Sl st into top of first tc st to finish. Round 1: with topaz and 4.0 mm hook, sc 6 in a magic circle. Continue in a spiral. Wire the arms and attach to the body. Hooray! Now in a few years, when you start thinking that Princess Tutu is really good, you’ll remember that it’s not really good until it’s over. 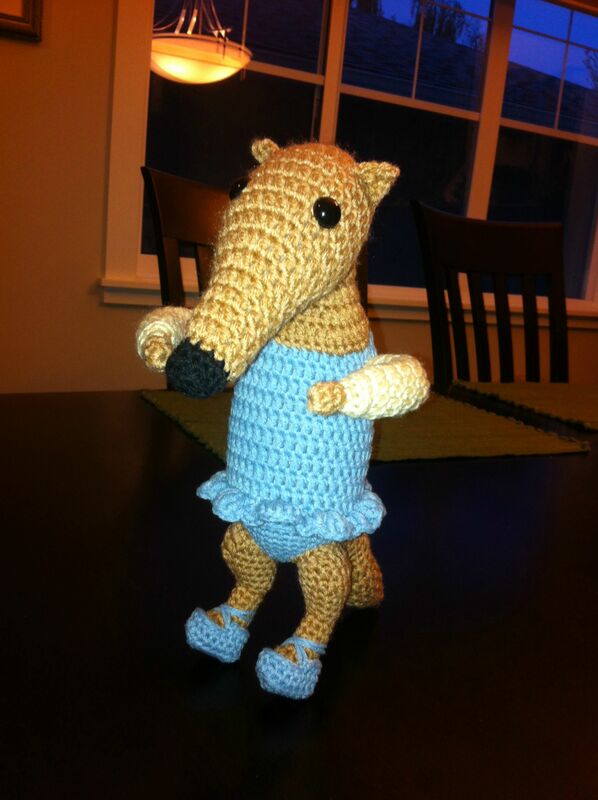 Also, there’s an anteater ballerina.